We all love Aladdin’s story, right? 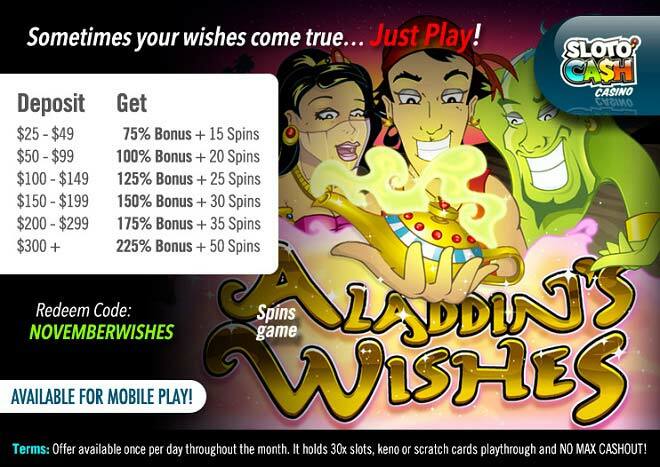 And this November you get the chance to rub Mr. Sloto’s lamp the right way for a genie to pop out and grant you up to a 225% Match + 50 Free Spins when you deposit as little as $25! Enter the world of Aladdin’s Wishes and you’ll be enchanted by the magic that one tiny lamp holds. Spin symbols like Aladdin, a Genie, a Princess, the Magic Lamp, the Magic Carpet, a Monkey, Arabian Swords, and many other images that will transport you to this fantasy world. Mr. Sloto’s personal genie is waiting to grant your winning wishes and make them come true this November with your deposits of as low as $25!